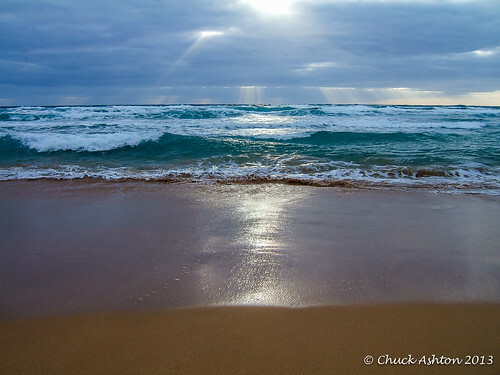 Last week my Kauai pictures went over 500,000 views! Someone likes them because over 1,5 00 pictures have been tagged as a favorite. I take them because I enjoy the scenery and I am happy others enjoy them too. 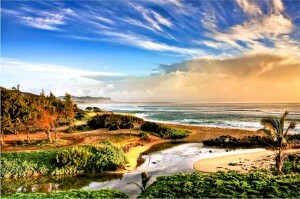 The island of Kauai is located about 20 minutes away via cheap flights from Honolulu. It is the fourth largest of the Hawaiian Islands and is also the oldest at six million years old. 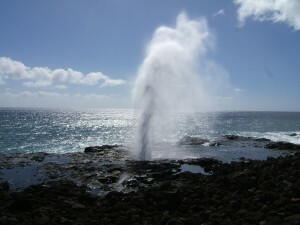 It was formed as the Pacific plate slid over the Hawaii hotspot, and the island is certainly volcanic in its origins. This fiery birth resulted in the incredibly rich soil and lush growth of trees and plants that now cover the island; hence the name Kauai, its title as the “Garden Isle”. A small island, covering approximately 550 square miles, Kauai can easily be traversed within four hours. Kauai maintains a comfortable average temperature of 78° F and the ocean waters surrounding the island hover between 74°F and 80°F. Kauai is also very rainy; one of the wettest places on earth is located here on the east side of Mount Wai’ale’ale, with an average annual rainfall of 460 inches. The huge amount of precipitation feeds the many scenic waterfalls, and it also carved out the deep valleys and canyons of the island that make Kauai so spectacular. The first European to set foot on Kauai was Captain James Cook who sailed into Waimea Bay in 1778, and named the location for the Earl of Sandwich, his patron. Along with the neighboring island of Niihau, Kauai was the last of the Hawaiian Islands to become a part of the Kingdom of Hawaii under King Kamehameha in 1824. Beginning in 1835, the sugar industry became the dominant force in the Hawaiian economy, with the first sugar mill being established in Old Koloa Town in the same year. Sugar remained a booming industry there for more than a century, but today many of the plantation lands have been converted for ranching. The last remaining sugar plant is currently transitioning to sugar-ethanol production. The volcanic soil and heavy precipitation result in Kauai having exceptionally fertile land. In addition to sugarcane, coffee and many varieties of fruit, including banana, guava, mango, papaya and pineapple are also cultivated. Kauai is home to thousands of wild roosters and chickens. Descended from Polynesian and European chickens, they roam freely with few natural predators. Kauai is also home to a large population of stray cats that have had a detrimental effect on the native wildlife, particularly the birds. Waimea Canyon, located within Waimea Canyon State Park, is one of the most familiar locations in Kauai due to its frequent appearances on film and television; one of its most famous appearances was during the flight to the island in Jurassic Park. “The Grand Canyon of the Pacific” is the largest canyon in the Pacific and one of the most scenic. Surrounding it is Kokee State Park, a more than 4,000-acre expanse of Koa hardwoods and Norfolk pines, as well as native plants and wildlife. Visitors looking for an active itinerary in Kauai will enjoy the kayaking and coastal hiking trails along the Na Pali Coast. The Holo Holo Koloa Scenic Byway is a 19-mile stretch that connects many of the historical and cultural sites on the island, such as Malhuia Road, also known as the Tree Tunnel due to the canopy of eucalyptus trees lining it; and the Spouting Horn, a blowhole rock formation that spouts seawater plumes into the air. The start of our day on Kauai was a typical one. We walked 2.5 miles down Nukolii Beach. 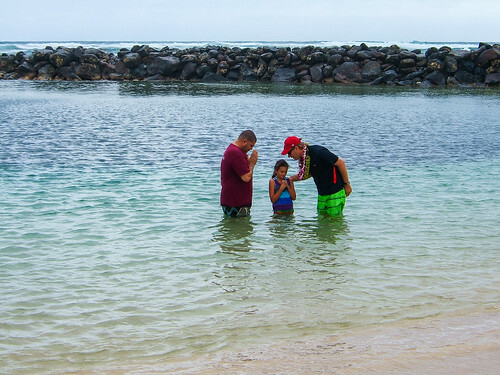 Once we arrived at Lydgate Park, we stopped and took a few pictures. The large community pavilion next to the beach was full of activity. Just as we started walking back down the beach a band started playing. We realized there was going to be a church service so we decided to return just to listen to the band and see what was going on. As we approached the pavilion, Bart and Cookie greeted us and told us they were holding their service at the beach this week to celebrate New Hope Church tenth anniversary. He made us feel so welcome we stayed for the service, bare feet, empty pockets, and pretty super casual clothes and all. Everyone was friendly and came up and introduced themselves. We met so many wonderful people. The service was so casual with lots of great music. 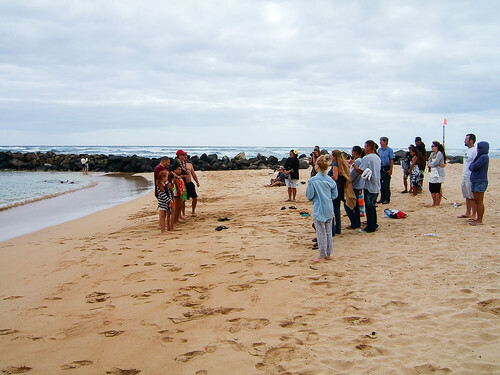 At the end of the service, everyone walked to the ocean where they held a baptism in the ocean. After baptism of four parishioners, they served a great home cooked meal. 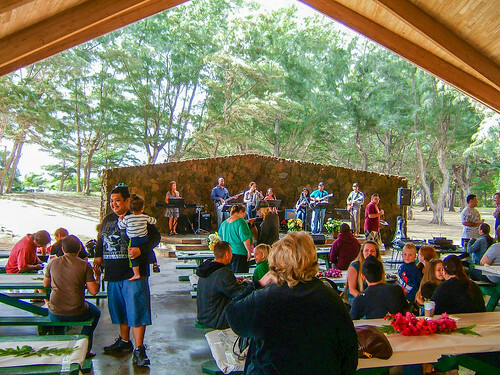 I would suggest if you want to attend a non-denominational church while you are on Kauai, New Hope Christian Fellowship Lihue would be a very good choice. I have so many pages to the right in the different Categories. I am quickly approaching 5000 on-line photos in the different albums. Here is another way to locate a picture album for the different areas of Kauai. 23 Photos have now been published in different national blogs/magazines/newspapers. (CNN) — When you want to get away from it all, set your course for these romantic islands, as chosen by Travel + Leisure readers. Kauai made the list at #4! It’s the oldest of Hawaii’s eight main islands — and arguably the most dramatic, with scenery that ranges from wind-eroded mountains and red-walled canyons to primeval rainforest and photo-ready waterfalls. Located on the Hawaiian island of Kauai, Hanakapi’ai Falls can be found deep in Hanakapi’ai Valley. Seeing the falls will take some effort. You first need to hike two miles on the Kalalau Trail before trekking another two miles inland. The hike is strenuous, and is eight miles round trip, but your efforts will be rewarded with a view of one of Hawaii’s most beautiful falls. go! 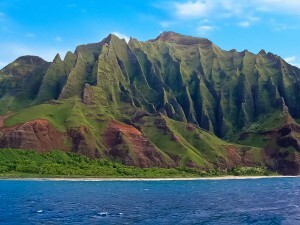 which offers direct flights from Kauai to Honalulu and Kahului but also connecting flights to the other islands. Other airlines providing inter-island flights from Kauai are Hawaiian Airlines and Island Air. Flight times from Kauai to the other islands is relatively short with a flight to Honalulu taking just 15 to 20 minutes and the furtherest flight to the Big Island taking nearly an hour and a half. If you want to explore several of the islands without spending a lot of time at airports, a relaxing way to island hop is with a cruise. Island cruises can offer luxurious surroundings and stress free travel in addition to the opportunity to see several of the islands in a relatively short space of time. There are a number of cruise companies offering itineraries which take in around four of the islands. Most cruises are for a duration of 7 to 14 nights, many departing from Honalulu and spend one or two days at each port, giving you the option to set off and explore each new island or perhaps take a break from island adventures to relax on board for a day. One advantage of taking a cruise as a way of island hopping is that you can enjoy the unique sea vantage point of the scenery of these beautiful islands during the day or at sunset over dinner while you cruise. If you think a cruise is for you but you are not sure which of the islands you want to visit, there are numerous island guides online to provide inspiration. Perhaps you want to spend the majority of your vacation on Kauai – and who could blame you – but you are interested in a small island hop just to explore something different. Island hopping doesn’t have to take days or weeks; it is possible to hop to another island for a day trip. 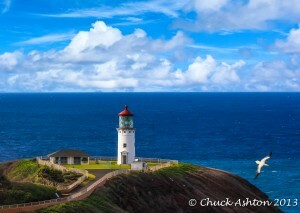 Possibly the best island suited to visiting in one day is the nearest island Oahu. With such a short flight time, you could easily fly into Honalulu in the morning and return in the evening. Certainly a popular day trip from Kauai is a visit to the famous Waikiki beach or those interested in a bit of history can take in Pearl Harbour, the Arizona Memorial and U.S.S. Missouri; all located on Oahu and can be organised as a guided tour or you can make your own travel arrangements to give you the freedom to explore at your leisure. Alternatively, you could head to the North Shore of the island and Polynesian Cultural Centre. For something really unique, why not take a helicopter tour of Oahu, experiencing the breathtaking scenery of jungles, beaches and ocean from above. highlighting the great things about Kauai. The picture the article used for Kauai was right off our Kauai Beach Villas G6 lanai. That’s 22 pictures published that publishers have picked up off my Flickr picture page. 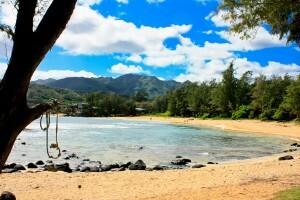 Some recent pictures I took February 2012 around Hanalei Bay Resort 52012. At the start of the beach trail. What a great beach bay. Along with the sun and surf it has a nice beach path toward the north. It winds along the oceans edge for about a half a mile. At the end of the trail is a coral reef and rock outcropping. There were lots of green sea turtles at the coral outcrop. The trail dead ends into the nature conservatory, which is off limits. In the winter time the path is a fantastic place to watch whales. You can actually do the path in flip-flops so take off and enjoy. The path at the southeast end of the bay is lined with lava boulders. You spend a lot of time hopping from one bolder to the next and the view at the end is just more shoreline and boulders. Don’t miss the northern end, it is very nice. Ocean views from your lanai.